LaCie has offered network-attached storage (NAS) for years, and the most feature-rich and home focused of LaCie’s current NAS lineup is the d2 Network drive. This solid gray brick of a device is a surprisingly versatile, feature rich, and easy to understand unit you can use to store media files so that they are available to everyone on your home network. The d2’s setup was relatively painless, at first. The six-step process is easy to understand and designed with both Mac and PC users in mind. However, when setting up the administrator account using the Web interface in Safari, initially the login wouldn’t accept the preset passwords. It turns out that Bonjour adds a dot (.) to the URL in Safari. Once we deleted the excess dot, login worked. As of this writing, LaCie is working on a solution to this bug and hopes to create a fix. While not as approachable as Iomega’s Home Media Network Hard Drive ( ) or Western Digital’s Western Digital My Book World Edition ( ), LaCie’s software interface is nonetheless easy to use and provides plenty of power. You use a desktop application to see which folders on the LaCie are shared and to adjust network settings. The browser-based software interface has seven blue tabs on the left of the screen to denote the server’s various control options. You can create and configure users, groups, and volumes within seconds. Set up a shared folder in the Shares tab and you can also use the drive with Time Machine. The higher-end features of the drive, such as using it to download files via BitTorrent, are available through this interface. However, they require more explanation and are less intuitive, so you’ll have to consult the instruction manuals on the software CD. The d2 requires you to use its Web-based software to access the music on the drive, so you have to log in with the LaCie Web software each time you reconnect to the iTunes server. But once you log in, the volumes appear in your shared folder in iTunes. The d2 supports BitTorrent downloads, but it was designed for small files, not the large ones associated with BitTorrent videos. BitTorrent sites that specialize in large media files often use complicated and demanding protocols that the LaCie is not designed to handle. The LaCie’s BitTorrent download capabilities skip a step in the download process by downloading to the drive itself rather than to the host computer, which frees up the computer for other functions. Compared to other home media servers we’ve tested, the d2 drive was the easiest to configure for Time Machine; you authorize a folder to be Time Machine compatible when you create it in the Shares tab of the LaCie software interface. Select the newly created folder as your destination for backup, and you’re all set. The LaCie also comes with Intego Backup Manager Pro backup software. The d2 is equipped with a USB 2.0 and an eSATA port for connecting a hard drive to augment the storage capacity of the d2 network unit. That said, a 1TB capacity should be plenty of space for at least a couple of consumers’ Time Machine backups. While feature rich, the d2 still has room to improve. Currently, the d2 does not have remote access. Remote access is a nice feature that allows you to view and use data stored on their home media server over the Internet. The d2 also doesn’t support a print server, a feature that is helpful for home or office settings that want to enable sharing of a single printer throughout the network. 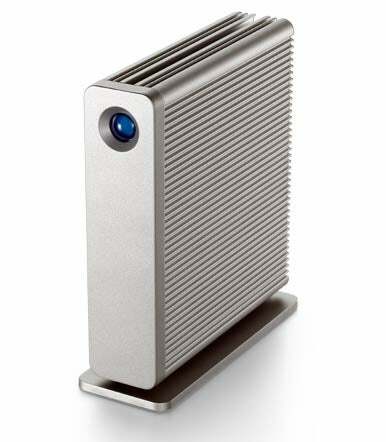 The home media server evolved from the NAS devices that LaCie had mastered and so the company clearly knows how to produce a sleek and versatile machine in the d2 Network. LaCie may have lost a little of their edge over the last year (given the release of similar products by Iomega, HP, Western Digital, and others) but LaCie still produces a solid performer with a rich set of features, a large capacity, and a satisfactory interface.